Norwegian (NAS) today reported a second quarter 2013 pre-tax profit of 277 MNOK, an improvement of 152 MNOK from the same quarter last year. The second quarter is characterized by a strong unit cost reduction, solid production growth and a higher load factor. 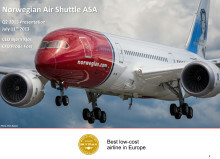 The unit cost reduction of 9 percent was achieved despite start-up costs for Norwegian’s long-haul operation and the establishment of new bases in Europe. The cost reduction is essential to strengthen the company's competitiveness. The total revenue in the second quarter was 4 BNOK, up 27 percent from the same quarter last year. The pre-tax result (EBT) was 277 MNOK, an improvement of 152 MNOK compared to second quarter 2012. More than 5.5 million passengers chose to travel with Norwegian during the second quarter, which is an increase of 23 percent and more than 1 million passengers compared to the same period last year. 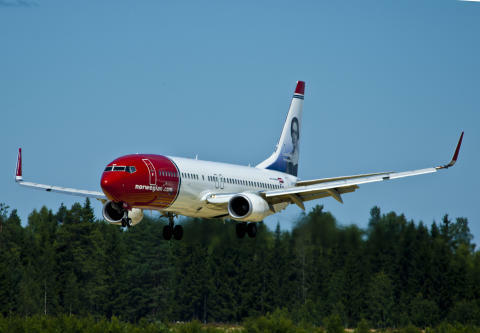 The company’s traffic growth (RPK) was considerably higher at 35 percent which reflects that each of Norwegian’s passengers on average flies significantly longer than they did a year ago. The unit cost reduction is 9 percent. Norwegian realized a solid production growth (ASK) of 34 percent. 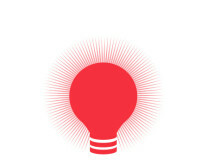 The growth is distributed across all markets in which the company operates. Despite Norwegian’s strong capacity growth, the company is still filling its seats. The load factor in this quarter was 77 percent, up one percentage point from the same quarter last year. 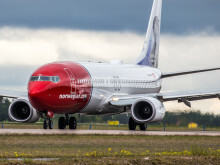 On its long-haul routes, Norwegian has had a load factor of 96 percent, while the load factor at the new Gatwick base has already reached 85 percent on the newly launched Mediterranean routes. 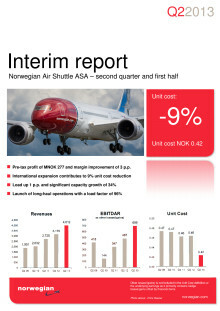 “This has been a very good quarter for Norwegian. We have finally started our long-haul flights and we have opened a new base in London. The international growth strategy is starting to yield results; we have managed to cut costs despite substantial growth, which is essential to strengthen the company’s competitiveness,” said Norwegian’s CEO Bjørn Kjos. Norwegian was recently awarded the title “Europe’s best low-cost carrier” by the renowned SkyTrax World Airline Awards, where the passengers themselves decide the winners. The Swedish Quality Index, meanwhile, recently ranked Norwegian as «Sweden’s best airline». “The most important evidence of customer satisfaction is the fact that more and more people choose to fly with Norwegian. It is essential to get new customers on board so they can get to know our product. We also look forward to start flying the Dreamliner on the long-haul routes to New York and Bangkok from mid-August,” said Bjørn Kjos.